JKYog is committed to the overall development of a child’s future, in a highly conducive spiritual environment. Under the portfolio of Bal-Mukund, JKYog is proud to announce the launching of “Chhote Kavi Contest 2013” for children residing in US between the ages of 8 to15 years! Encourage the younger generation to be confident and proud of their rich cultural heritage. Each participating contestant is expected to write a poem to describe the topic of their choice given below. It is expected that the entries be original and the moral value/significance of the topic should be emphasized. The contestants are categorized into two age groups. There will be three winners in each category. Topic 2: Gopal is Mine. Topic 1 : Respecting Humankind. Topic 2 : God’s Blessings. 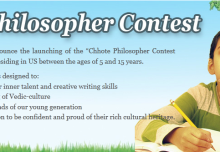 Hurry Up & participate in “Chhote Kavi Contest 2013″. Through their creative writing skills, children will be able to comprehend teachings of our Vedic culture and gain practical knowledge on how to face challenges in their lives. This practical knowledge is an indispensable tool in a highly dynamic and rapidly changing environment such as the one we live in today. Entering into an effort such as this will allow for children to inculcate and ponder over the highest values, ideals and become familiar with details of Hinduism and their cultural background. 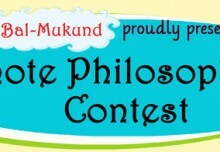 Eligibility: The Bal-Mukund Chhote Kavi Contest is open to all kids aged 8-15. Each participant may submit one poem of no more than 300 words for age group 8-11, and 600 words for age group 12-15 on the given subjects. All entries must be sent via website and must have completed on line Registration form. Entrants must fill out the entry form completely to qualify for the contest and may submit no more than one poem per contest. Contest Dates: It is necessary to register for the contest. Registration will start from June 15th. Entries are accepted from July15th to October15th. The deadline of submission is October 15th2013. Selection: Poems will be judged based on originality, creativity, and artistic quality. Poems not meeting the requirements for word limitation are automatically disqualified Poems containing profanity, vulgarity or offensive material are automatically disqualified. Prizes: 1st, 2nd, and 3rd place winners will be selected in each of two categories: Category 1 (Age group 8-11) Category 2 (age group 12-15). Each winner will receive prizes to pursue literary endeavors in Vedic culture. In the event of a tie, duplicate prizes will be distributed. Fees: Participation in this contest is free of charge. Copyrights:All submissions become the property of Jkyog and can be considered for publication in a forthcoming e-magazine and may appear on the website and/or various other media. Notification: Winners will be announced by November 30th 2013. Winners will be notified by phone or by email. Names of the winners and their respective poems may appear on the website. Legalities: Program sponsored by Jkyog. All rights reserved.